I’ve only been back in Dallas for a few days, but I have to admit I’m already missing New York. There’s something about that big, crazy city that makes me feel alive and ready for anything. There’s endless inspiration to digest for the blog, fun meetings and plans with friends, and countless restaurants and shops to explore. It’s hard to come back to a city you’re so used to and expect to continue to be inspired and invigorated by it, however everyone I know who lives in New York never seems to have that issue. I’ve been in Dallas since 2005 (with a short layover in Houston back in parts of 2010/2011) and it feels like it’s time for a change. Anyone else struggle with this? It could be because of my desire to travel the world that keeps me feeling ADD about my current location, but honestly, I may just be bored. While I’m not planning to relocate right this moment, it’s definitely on my mind more these days. My travel plans of late have transformed from short weekend trips to weeks-long extended visits, simply so I can be somewhere else for awhile. Next month I’m going to Austin for about two weeks to celebrate the 4th of July and my birthday the following weekend, and after that I’ll be heading back to California for the annual family trip to San Diego. Then comes New York again for fashion week all over again! I’m considering sub-leasing a place up there for all of September (and perhaps October, too) so I can quench my thirst of that city for a while. Anyway, I guess I’m just in a New York state of mind! 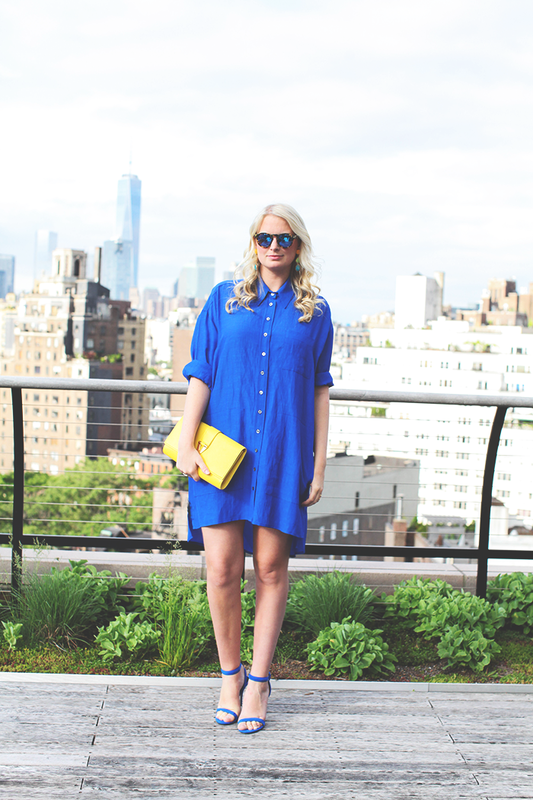 These photos were taken on my friend Sarah‘s rooftop terrace in the West Village – isn’t it stunning? The perfect New York City backdrop. I picked up this dress at Topshop a couple weeks ago (not yet available online, but love this similar dress) – it’s definitely my color, and it is perfectly matchy-matchy with my Alexander Wang sandals (which are now on sale!). You’re probably already sick of these Illesteva sunglasses – I can’t stop wearing them! They’re the ideal summer sunnies with reflective lenses and tortoise-shell frames. Beautiful bold color on you! And love your curls. I totally understand, sometimes we just need a change of scenery for a while. Cobalt suits you well, love the pop of yellow. Great color on you! Love it! Looks like you has a great time in NY! I’ve been feeling restless with our current city too. I suspect that happens anywhere after you’ve lived there long enough. Love the color on you, as always! I can totally relate about NYC. It’s one of the most magnetic and energizing cities in the world! Great outfit. Blue and yellow are one of my favorite color combos for this time of year. I totally agree with what your feeling! I am beginning to need a change to pace too and NYC is amazinb. There is just something about that city.. 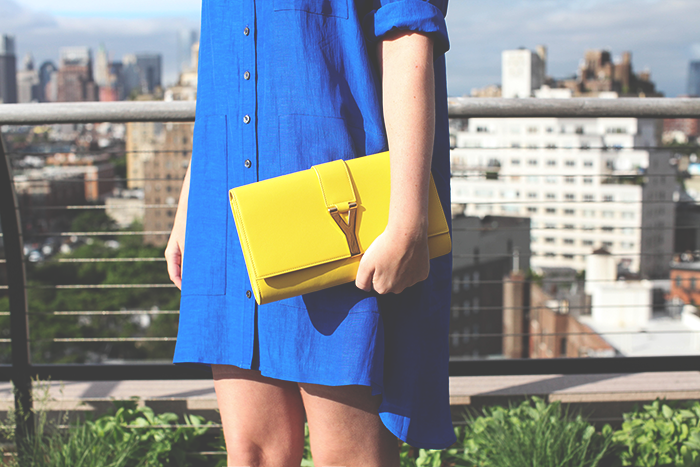 Ever sense you posted images of your yellow YSL clutch last week I have been thinking of it ever since! It has quickly moved to the top of my wishlist, such a beautiful piece. I am eyeing the light blue or red hues. That color blue with pop of yellow is so pretty! And I hear you but it is funny, living in New York, you still have that same feeling too, for me it is Paris, London other cities that are also very inspiring. There is always something new though here, so it would be awesome if you moved here:) Have a great weekend! I am so not sick of those sunnies, I love them, but hate that they’re sold out everywhere! I feel the exact same way whenever I visit NYC, I’m completely smitten with it! I fell head over heels in love with NYC when I went last time and I am going again this month! Gorgeous look! 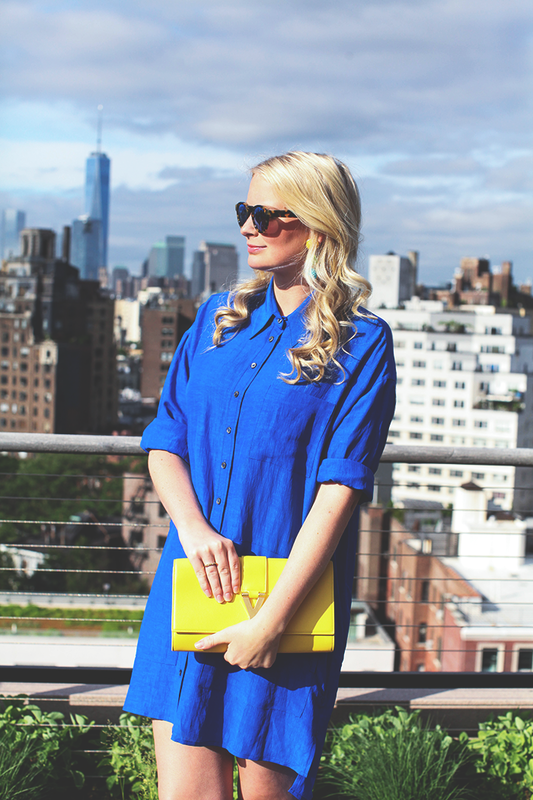 I love blue and yellow together and that shirtdress is perfection. Wonderful photos… That truly is the coolest location. Happy Weekend! Blue is a fantastic color on you! I love the pop of contrasting color from your bag too. I need to try the white eye liner tip. I have heard it before, but I too am a creature of habit when it comes to my makeup. New York sounds like so much fun! I have always wanted to visit. Maybe you can plan more trips there?? Love the combination of yellow and blue! That dress is beautiful. Such a beautiful color on you! I always love seeing those sunnies – I might just have to get some! Love this color and such a beautiful backdrop! New York does have a way of making people fall in love with it. There are definitely moments that I don’t love living here so much, but all in all, it’s pretty great. Simply stunning!! Love that backdrop, so beautiful! So pretty – love that color! I love this dress! OK, I love all shirt dresses. This color of blue looks wonderful on you. Sorry you are missing NYC. It’s such a cool town. This bag is TOO good! Loving your look! I totally understand about NYC. It is such an amazing city! I think being there for a few weeks around Fashion Week will help you figure out if you want to make a move. I love this dress on you. As you know, this is your color and I love that clutch! You look beautiful in blue and the backdrop is beyond perfect for a good NYC post!! The city def lures you in. I wish I could have a permanent apartment there and pop back at forth at my leisure… wishful thinking ;) Enjoy your travels!!! I’ve been wanting a change of scenery but that’s not easy when you have a home. Anyway love the color combo. Is it weird that I sensed your restlessness before you wrote this post? I’m not creepy, I swear! Ugh, I have 3 degrees, and I can’t spell advice. Smh! Hi Merritt! I couldn’t agree more with your words! I’ve felt so identified reading this post, the time for a change, the desire to travel… And what an enviable agenda! wow! I can’t wait to visit your dreamy country. Now the important thing. This outfit looks perfect on you! The sandals are ideal! LOVE all the blue…I would wear colbat everyday if I could!